Mi25 is a momentum based small cap oriented stock investing system for Do It Yourself accounts. The basic nature of the system is to run a portfolio of up-to 25 stocks allocated at 4 % of portfolio value at entry. The basic idea is built on the tenets of “Bhav Bhagvan Che’ ” or “Price is God”. We follow momentum until the momentum breaks and gets us out. As a result this strategy has a in built safety mechanism (Tactical allocation between Stocks and Debt) as stocks will exit once they lose momentum or if the entire market starts to fall sharply. The portfolio changes and strategy performance are updated here on this blog in the quarterly report. The portfolio is shared on a shared google-sheet and weekly updates are sent on designated day at 3.15 PM every week by email. The exited stocks create the cash level while new entries can be done at 4% of existing portfolio value ( including cash). This product is suited for a modest model allocation of around INR 10 lacs. If you are investing larger amounts, please consider Mi30 or Mi50 or Mi40. 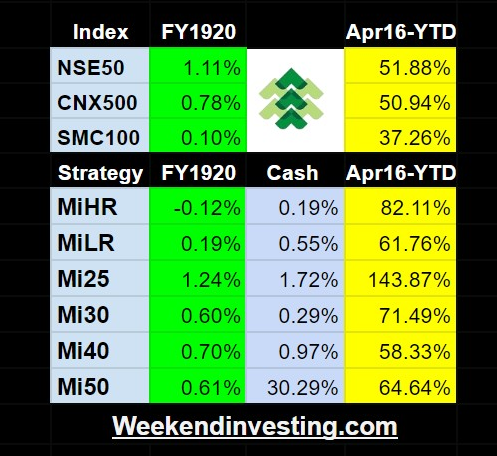 Please contact me at alok@weekendinvesting.com) for a complete diversified portfolio strategy.